Gaffer tape and duct tape are just two common utilities that we use in our homes, offices and workshops. These are often needed when we need to tie things together such as wires, cables etc. or anything that has broken down and needs to be mended. Note that gaffer tape and duct tape are not the same and have certain differences. Moreover, there are certain situations where it would be better to use one rather than the other. Let us briefly describe the two and illustrate their differences. Gaffer tape is also known as gaffing tape or simply gaff tape. It is a tough and a strong pressure sensitive tape made from cotton cloth which has strong adhesive properties. It is normally used in theatre, television and film productions. It may also be used during live performances or for any other kind of stage work. This tape is sometimes referred to as a production expendable as it is discarded once used and then has to be re-ordered periodically. Gaffer tape is named after the gaffer or the CLT, that is, Chief Lighting Technician (CLT) on the film crew. The process commonly referred to as gaffing on sets is one that involves the taping down of cables on a stage or any other surface. This is done as a safety measure or merely to keep the cables out of camera view or audience view in the case of theatre performances. This is what is known as gaffing the cables. Duct tape, which is also known as duck tape is also a pressure sensitive tape that is coated with polyethylene. It is cloth or scrim backed. 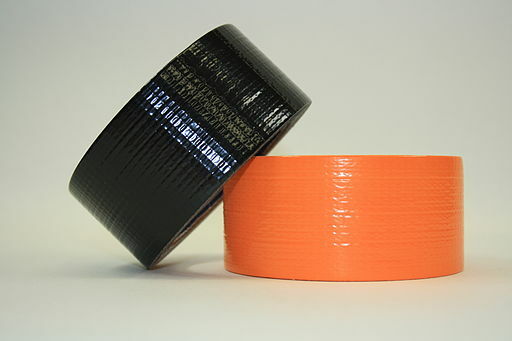 The making of this type of tape has variations in construction. One of them is using different adhesives and workings. Another one is the use of gaffer tape that can be cleanly removed. Duct tape, however, cannot be cleanly removed. Furthermore, one variation is to use a heat resistant form of duct tape that is useful for sealing various ducts such as heating, ventilation, air-conditioning etc. These are especially produced because normal duct tapes fail in such conditions such as extreme heat. The colour of duct tape is black or grey but it can also be available in other colours. One of the most significant differences between gaffer tape and duct tape is that only the former can be removed cleanly. This is because gaffer tape does not use a natural rubber adhesive; it rather uses a synthetic adhesive that is petroleum based. Duct tape, on the other hand, does not remove cleanly and as mentioned above, a certain duct tape is especially prepared to be like gaffer tape so that it can be removed cleanly. Moving on, there is a variety of uses in which these two types of tapes are used and some of them are very different. Gaffer tape’s most common use is to secure cables to the stage floor. Moreover, camera assistants also make use of gaffer tape to lay blocking markers for actors and other personnel. In this regard, they use short strips of gaffer tape that are of different colours. Duct tape is used more in situations that demand a tape that is sticky, strong and flexible. Some of them are especially made to have a long lasting adhesive as well as resistance to weathering. Duct tape has been used for over 40 years in motorsports for the repairing of fibreglass bodywork in addition to other uses. Duct tape also has a lot of uses in spaceflight, military and so on. allana. "Difference between gaffer tape and duct tape." DifferenceBetween.net. February 25, 2015 < http://www.differencebetween.net/object/difference-between-gaffer-tape-and-duct-tape/ >.